Look for coverage on these RSNA topics and more in Radiology Today in 2009. What was the big topic of discussion at RSNA 2008? Pretty much the same thing it is everywhere else: the economy. Topping this year’s edition of “Five Things to Watch” from RSNA with anything other than the economy would ignore the reality concerns most people heading into 2009. After scouring the exhibit and lecture halls of McCormick Place in Chicago, we present what the Radiology Today staff saw as hot topics to watch in the coming year. No. 1: It’s the Economy, Stupid. Talk of the economy permeated attendee discussion at RSNA 2008. People were wondering whether facilities are going to put off purchasing million-dollar scanners in the double whammy market of declining imaging reimbursement and a national recession. On the heels of that question came the seemingly inevitable follow-up: If imaging facilities decide to buy major equipment, will there be capital available to finance purchases? There seemed to be a spate of new, lower cost digital x-ray providers in the exhibit halls, potentially creating a disruptive technology situation. PACS vendors continued touting low-cost-of-entry networks structured to minimize the capital needed for a digital installation or upgrade. This growing trend transfers more of the systems’ cost from capital to operating budgets, which is attractive to imaging facilities strapped for capital. How did the economy affect this year’s meeting? 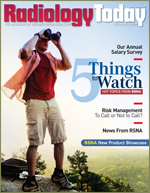 RSNA reported a modest 4% drop in exhibit square footage from 2007. The exhibit hall floor looked less busy because that space was spread over three exhibit halls instead of two like in 2007. Numerous vendors reported bringing fewer employees to the show than last year. There were predictions and no answers, but the economy was obviously the No. 1 topic attendees were watching—albeit anxiously—for 2009. No. 2: It’s Still the Economy. Everything else finished a distance third to how the recession would ripple through radiology. No. 3: Broader Reimbursement for CCTA and CT Colonography. Cardiac CT angiography (CCTA) is currently covered by Medicare under local coverage decisions but often is not covered by commercial health insurers in the absence of a national coverage determination. Given the uncertainty of reimbursement, it’s understandable that hospitals, imaging centers, and cardiology groups would be reluctant to invest in the high-end scanners to perform the exam. Daniel S. Berman, MD, a cardiologist who is president of the Society of Cardiovascular CT, told Radiology Today that CCTA advocates were meeting with commercial insurers in Chicago during RSNA to discuss what the payers are looking for to convince them that CCTA should be covered under their policies. Berman noted that insurers would balk at paying for new imaging procedures without strong evidence that they could save lives and healthcare costs in the long run. Berman is confident in the technology’s benefit as a rule-out diagnosis when patients present with chest pain. Sending patients home when their scan results are negative will save the system money in hospital stays and the string of tests that typically come when a patient presents with chest pain. “We are cognizant of the need for the [healthcare] system to not spend more money. We are confident this will fall right in with Barack Obama’s line,” Berman said. One hinderance to broader reimbursement is the lack of multicenter prospective trials showing the benefit of CCTA. Berman said to look for published results from a large multicenter, prospective trial to investigate CCTA in an acute setting during the first half of 2009. Looking beyond 2009, Berman said to look for new study data on using CT to assess myocardial perfusion. And speaking on the current and future outlook of CT colonography (or virtual colonoscopy), Elizabeth G. McFarland, MD, director of CT colonography for the Centers for Diagnostic Imaging, noted some of the same concerns as Berman did about CCTA. Nationally, virtual colonoscopy is only covered in the event of failed optical colonoscopy, McFarland noted, adding that there is an anticipated meeting on national coverage in February. Virtual colonoscopy advocates hope that the procedure will be covered if doctors and patients agree to be enrolled in clinical studies to better define the outcomes of the scanning procedure. With both CCTA and CT colonography, there are other technologies waiting for broader reimbursement to spur their wider use. Computer-aided detection shows potential to catch additional cancers and increase the efficiency of the CT colonography exams and is also being developed for CCTA. In her address to the membership during RSNA 2008’s opening session, RSNA President Theresa C. McCloud, MD, pointed out that radiology’s future is one of continued subspecialization and globalization. McCloud noted that fewer radiologists in the United States are generalists and that subspecialty radiology has become the reality. U.S. radiologist training programs are increasing the emphasis on subspecialization. The one-time physical challenges of transporting film images between where they’re obtained and the reading radiologist has been solved by teleradiology. That access to subspecialty expertise has expanded well beyond the physical proximity of academic centers and is transforming radiology. Subspecialty reads are a fast-growing segment of the increasing teleradiology market. Radiology’s bright future, she contends, requires global organization, coordination over subspecialty radiology, and establishing a “world standard of practice” for radiologic care. No. 5: Slice War Cold War. The 512-slice scanner did not turn up on the RSNA 2008 show floor, but CT advances are an evergreen topic at the annual meeting. Manufacturers touted issues beyond just slices for producing high-quality images. Toshiba’s 320-slice Aquilion ONE is the current slice leader, but the company focuses on its ability to image most organs in one pass, rather than the system’s number of slices. Philips Medical Systems showed its 256-slice Brilliance iCT. Siemens Healthcare unveiled its dual-source Somatom Flash Definition, a scanner with two 128-slice scanners combined to provide faster imaging and greater coverage per gantry rotation. GE Healthcare showed its LightSpeed VCT XTe configuration that the company says reduces patient dose by up to 40% during routine imaging. The XTe configuration is part of GE’s 64-slice VCT product line. The Big Four CT manufacturers offer scanners at different price points for different needs. One interesting thing to watch will be how facilities will make that selection and how much it will be driven by price alone in the current economy.